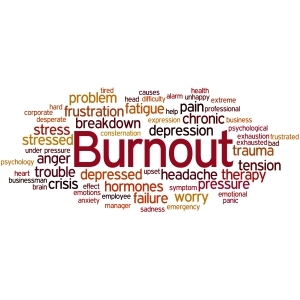 Burnout is a state of emotional, physical and mental exhaustion which leaves you feeling at rock bottom, alone and unable to cope. It can happen to the best of us, but especially the ones that are driven to succeed, go the extra mile or who throw everything they have at life and career. Be mindful of your physical, mental and emotional being. Listen to what your body is telling you and take regular health checks. Identify the source of your stress and address it as a priority. Reflect on the challenges you may be experiencing. Why are they a challenge, how are you reacting, what effect is this having on you, and how can you change the situation? Eat well and regularly. Eat foods that build your strength and resilience such as good quality protein, wholegrains and vegetables, and keep well hydrated. Exercise regularly. It rebalances the effects of high levels of stress hormones and makes you feel happier and more positive. Take regular breaks from intense work. Our body clock works in cycles and regularly seeks recovery time. Take a ten-minute break every hour and do something completely different. Manage digital technology. Social media, emails, computers, phones sap your time and impact your sleeping patterns. Don’t allow it to control you! Do everything you can to get a good night’s sleep. Make sure your bedroom is quiet and dark and keep digital technology out of the bedroom. Learn to say no. You don’t have to say yes to anything you do not have the capacity to fulfil. Have fun and laugh. It’s the best medicine. This means spending time with family and friends. If you need it, get help. Things can’t always be solved alone. It is nothing to be ashamed of. You are in this situation because of how hard you work. There’s lots out there to support you. Learn more about dealing with stress in my best-selling book, ‘How to Prevent Burnout’.